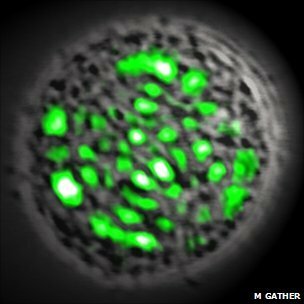 A single living cell has been coaxed into producing laser light, researchers report in Nature Photonics. The technique starts by engineering a cell that can produce a light-emitting protein that was first obtained from glowing jellyfish. Flooding the resulting cells with weak blue light causes them to emit directed, green laser light. The work may have applications in improved microscope imaging and light-based therapies. Laser light differs from normal light in that it is of a narrow band of colours, with the light waves all oscillating together in synchrony.